CHARMING RANCH STYLE COUNTRY HOME WITH BASEMENT ON 38 ACRES WITH FOREVER VIEWS. THIS CHARMING HOME IS LOCATED CLOSE TO THE TOWNS OF LIMON & HUGO & HAS EASY ACCESS TO STATE HIGHWAYS & INTERSTATE 70. 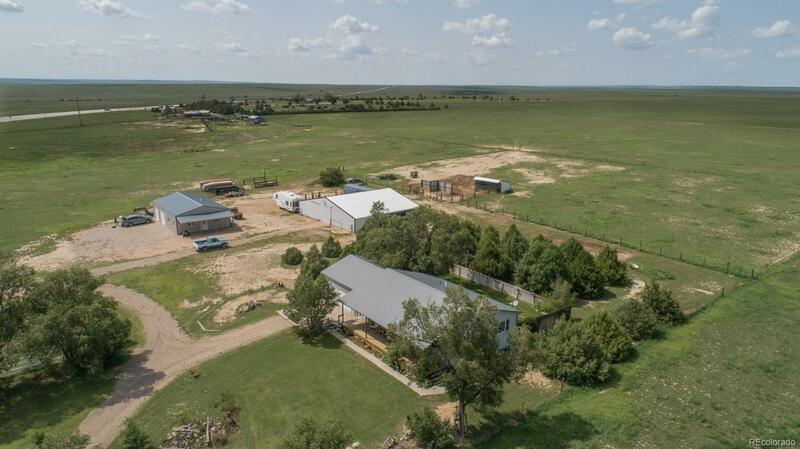 SET ON A HILL OVERLOOKING THE TOWN OF HUGO, THIS PROPERTY HAS EXPANSIVE VIEWS IN EVERY DIRECTION. THERE IS AN OPEN CONCEPT ON THE MAIN LEVEL WITH LAMINATE WOOD FLOORING. THE GREAT ROOM HAS A VAULTED CEILING W/LARGE WINDOWS TO ALLOW NATURAL LIGHTING. THE KITCHEN IS WELL LAID OUT WITH A BUTCHER BLOCK ISLAND & EAT-IN AREA. THE BASEMENT HAS 2 BEDROOMS & LARGE FAMILY ROOM AREA & WORK AREA. TRUE COUNTRY LIVING! THERE IS A 60X50 BARN (that is a blank slate for your design) WHICH INCLUDES A SHOP AND ADDITIONAL PARKING, THERE IS ANOTHER 30X48 SHOP THAT IS FULLY FINISHED AND HAS AN ATTACHED OVERSIZED 2 CAR GARAGE (not included in these measurements). THE PROPERTY HAS MATURE TREES & LANDSCAPING FRONT & BACK WITH A FULLY FENCED BACKYARD. EVERYTHING IS HERE FOR YOUR TRUE COUNTRY LIVING EXPERIENCE!